Only 10 days before Christmas, you are busy and running out of time or ideas? Don't worry, we are here to help! We put together a list of 10 sewing project ideas for unique gifts. Avoid the crowds, put on some music and spend quality time in your sewing room rather than running in a shopping mall. Hostess gift, teacher gift, stocking stuffers, last-minute party outfit items... we got you covered. For you (yes, you deserve it too! ), your mom, godmother or a friend. A quick project that requires minimal adjustments and that has that wow effect! To keep small and big feet warm during winter. Made with Polartec Power Stretch or in a french terry (if it has 40% stretch BOTH ways), it will be a success! The 2318 pattern is a classic. It includes mitts, tuque, aviator hat and slippers! It is one of the rare Jalie patterns that starts in newborn sizes. 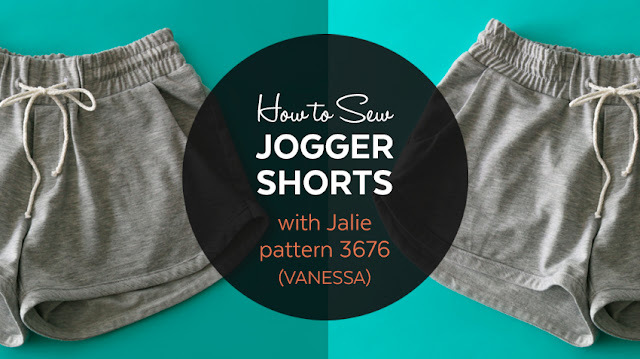 All the items in the pattern can be made with polar fleece and are quick and easy to make. For the aviator hat we made for Eleonore, we used Windpro fabric from Discovery Trekking with fluffy fabric for the inside to keep her warm. The harder face of the Windpro is great because it blocks the wind and is water resistent, perfect for spending long hours making forts and playing in the snow. We have already lots of snow on the ground in Quebec City and are sure to have a white Christmas this year! Super easy to make and very comfortable, this pull-on jeans is the answer to last-minute outfit planning! Use a shiny fabric or stretch velvet for a festive look. You know someone who loves Jalie patterns? Email her a gift certificate or print it out (send it to yourself to keep it a surprise ;)) to give in a card. The oh-so-soft cotton/lycra/rayon fabric from l'Oiseau was the perfect choice to make a raglan pyjama top. They have a wonderful selection for everyone, go take a look at their beautiful printed knits. Another classic that you can cut and sew in less than an hour. As a PJ bottom with the Mare-Claude or under a sparkly tunic, we want a pair in every color, don't we? Jupiter will come to the rescue to carry your shoes from one party to the other! You need to carry shoes for the whole family? Go with the larger version, Sirius! In the Galaxie pattern, you will also find great gift ideas that you can make with easy-to-find fabrics: lunch bag, beach bag, pencil case. It is a great stash buster. With Pluton and Neptune, easy-to-make bento bags, you can turn a plain food container into the cutest gift under the tree when giving home-made goods, from fudge to fruit cake. The pattern includes both the sweatshirt and sweat pants, and works for men and women, boys and girls. 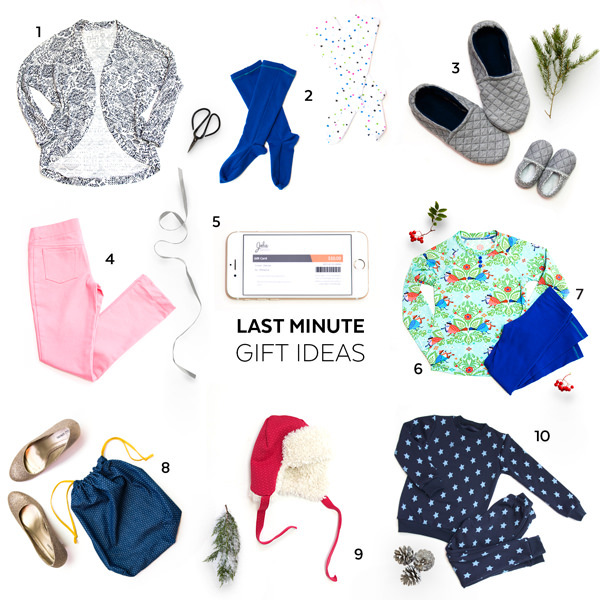 We hope this list will inspire you and help you complete your gift list in time. Sewing gifts are special. They will be cherished and remembered for years by those who receive them. We wish you and your loved ones a wonderful holiday season and a very happy new year.